Outlined in red the tee decks are in the upper left hand corner. 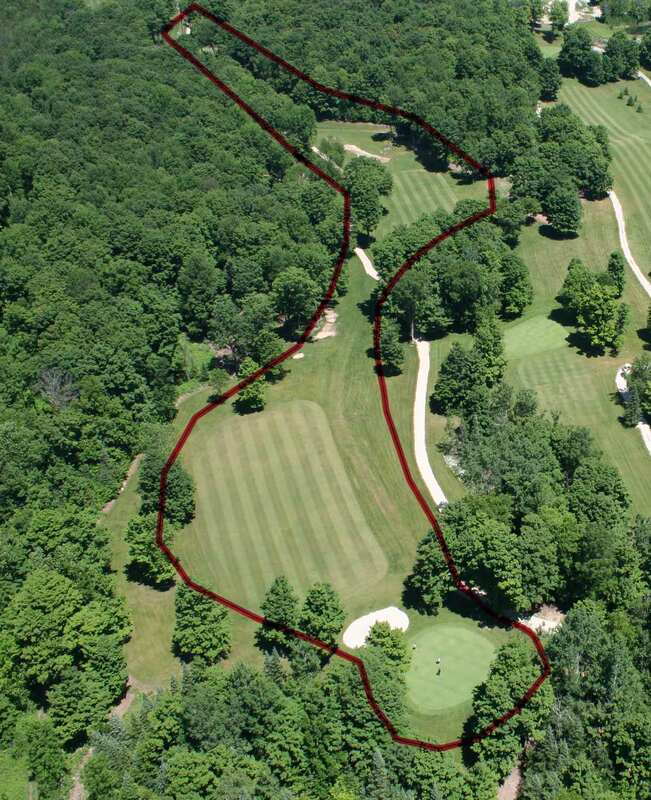 The tee shot is out of a chute of maple trees to a landing area 70 feet below. While the landing area is fairly large, the target area is only 50 feet wide. From the target area the second shot is through a narrow opening in some of our oldest and largest maple trees. After playing two precise shots, you will be positioned in front of an elevated green, completely surrrounded by trees, and protected by a large bunker in front. For the low handicapers, hole 7 is reachable in two by a well placed left to right drive, followed by a right to left second shot. After playing the hole there have been many a "chainsaw" joke, but everybody comes back to try the hole again.